Hello, my name is Pablo. This is my first year on FIRST Robotics team 1024, the Kil-A-Bytes, and so far my time on here has been very enjoyable.Since I have joined the team, everybody has been really friendly and encouraging. Not only that, but when I make a mistake they help me out and tell me what I did wrong and how I can fix it in the future. At first I thought my CADing was decent, but I have learned way easier ways to use CAD thanks to the great teachers and leaders on the team. This year I look forward to learning new things like the process of building a robot and a different wayof thinking. In the future, I hope to be a Team Leader to help others learn CADing and also to become part of the drive team to get us more momentum in the years to come. I’m very glad to have this opportunity as it will greatly benefit me if I am offered a job in engineering. I can’t wait to participate this year in the 2018 FIRST Robotics competition, POWER UP! Good luck to the teams out there and see you on the arcade! 1024 students started back to school about three weeks ago, and today marks our third team meeting of the school year. So far we have done a lot of cleaning in our shop. It’s good to start fresh, and that means making sure that all of our supplies and rooms are organized. With our Vex teams working in their own area this year, we are able to make better use of our shop area. We also have new a few new large pieces of machinery, including a brand new CNC. We also have a couple new mentors helping out this year. Cody is a 25 year old software engineer who participated in college robotics at Valparaiso. He is already improving our programming skills across the board. Mark is a former 1024 student, now engineer, proving that once a Byte, always a Byte. Next week, on August 31st, we will host our Fall Open House for new students, families, and potential sponsors. If you know of any people interested in joining our team, let them know that they’re invited to this Open House event. We can always use more eager students, mentors, and sponsors. Now that we are back to meeting once a week, look for more regular updates on Twitter and here on our blog! 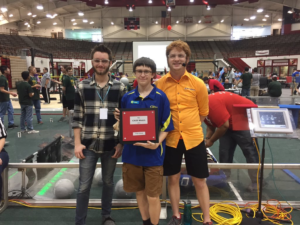 Last year, our main student programmer couldn’t make it to a Stronghold competition where we competed. Mark, as a sophomore, took the lead, and actually was able to figure out a programming problem that we’d struggled with all year. It’s this move-forward attitude that showcases why we are nominating Mark for the 2017 Dean’s List Award. Mark never gets short with anyone. He understands his own limits and will stay composed, cool, and patient when under stress. This season Mark was using an old robot to prototype using an encoder on our fuel shooter, training more inexperienced students. Instead of getting upset when the other students were goofing around, Mark led by example, staying calm and focused. Because of him, we will have students who are capable of programming in years to come. Mark has grown from a kid that was afraid of failing into a young man who is willing to try new things regardless of how they turn out. Yes, failure still sometimes frustrates him, as it does all of us, but, he has learned that even in failure there is success through learning. When adapting to a new vision tracking system, the Pixy camera, he didn’t hesitate to experiment. He has begun to give the other team members challenges and let them fail until they succeed, passing on this lesson to not fear failure. As a programmer, Mark has always had skills with syntax. His abilities have grown in the areas of organization, planning and structure. Just the other day, he very happily said, “Hey look, we almost have no code in the main robot.” Why is this important? It demonstrates that, instead of just piling more code in the same place, he used methods to structure the code before writing, thus creating modularity. This is more the “art” of coding that some people never quite grasp. Mark is also championing the use of Github to backup code. This is something that a programmer should always learn yet has been a failure on our team for many years. Mark is embracing the things a leader needs to do to ensure his team has the best opportunity for success. Dedicated to increasing the awareness of FIRST in Indiana, Mark participates in many of our team’s outreach activities. 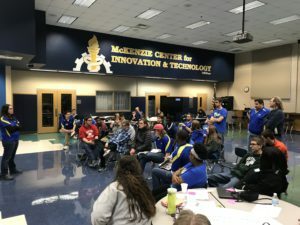 For example, this past year, at the GenCon League of Extraordinary Programmers demo, Mark inspired local software developers to become involved in FIRST as mentors and volunteers. At the Science and Exchange fair that took place at the J.W. Marriott he presented FIRST and our team to interested potential supporters. A Junior at Lawrence North High School, Mark’s academic success is apparent just by looking at his GPA of 4.0+. His future is bright no matter what he decides to study in college, but we are grateful that we have one more year with him as a member of the Kil-A-Bytes. It’s always impressive when a freshman in high school joins a team and makes an immediate impact on the varsity squad. Keith did just that when he joined team 1024 and was awarded a coveted spot on the pit crew, fixing the robot as needed and helping the team win one District Event and the State Championship. The next year, as a sophomore, he set his sights higher, taking over the huge responsibility as the robot operator and calmly helped bring home three District Event wins, the State Championship win, and the Carson Division Finalists award at the World Championship. Not one to let success get to his head, Keith applied to be a student leader, determined to help our team be even more successful his junior year. We hold all of our team members to high expectations. Keith holds himself to higher and shows an eagerness to learn and take on the challenge of building a robot. He models a good work ethic and positive attitude for his peers. 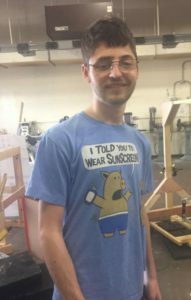 He is one of few students who can be counted on to focus on a task and see that it gets done, even when there are more interesting projects on the other side of the shop. An example of this is when Keith took time away from robot build to help with our Entrepreneurship Award submission in the middle of Build Season. 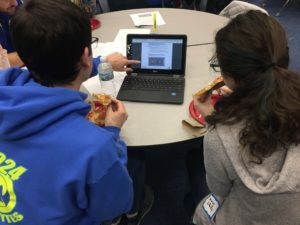 His expertise about the team was needed for writing at that moment, and he successfully transferred his robot build task to a younger student, showing that leaders know how to delegate. 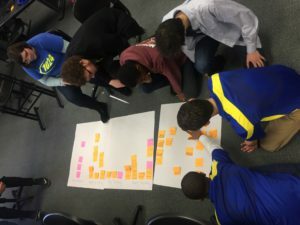 As a member of our student leadership council, Keith led other students through the prototyping, designing, and building of our Fuel handling subsystem this year. He also was in charge of documenting this whole process and leading discussions about design decisions regarding his mechanism. During team concept and design reviews, Keith answered team members’ questions clearly and thoughtfully, once again showing his calm demeanor. Keith is rarely absent from team meetings and attends all competitions. His dedication to the team is apparent; moreover, he’s devoted to inspiring younger students to pursue FIRST and STEM careers in the future. In the offseason, he serves as a coach at robotics camps, the last two summers for middle-school and upper-elementary kids. 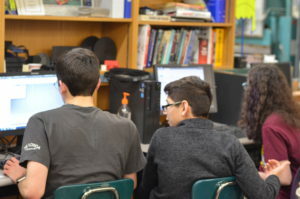 This year, he’s trying to collaborate more with the middle-school robotics teams, to try to increase student participation and involvement in the community, as well as develop student leadership for them. Keith learns quickly and is able to complete tasks with only little instruction. He is not afraid to ask questions but has the confidence to make decisions in order to keep working when mentors are unavailable. He is able to use what he has learned to assist his teammates. Keith was one of the first students to be trained in using the team’s CNC router and has since trained other students to master this machine. His experience drawing 3D models in Inventor has been instrumental in this year’s robot design. 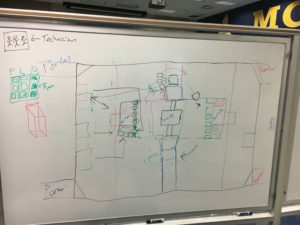 Given a few minutes discussion and a rough sketch on a white board, he can turn an idea into a robot mechanism. He has the patience and attention to detail to work through the nuance of a design problem before rushing to a solution. It’s evident, by the way that people rely on him at every team meeting, Keith is one of the most valued members of the Kil-A-Bytes, and we are honored to nominate him for the 2017 Dean’s List Award. Being on Team 1024 has certainly been a journey. I started off as a freshman, the year of 2014-2015, and at the time I was primarily just a VEX kid. The first time I ever did anything pertaining to FRC was the last week of build season that year. I had no clue what I was doing, and I felt quite out of place, but two juniors who were on the team (Kaylee and Cameron) reeled me in for the night and showed me some of the cool things that were being made for the robot. 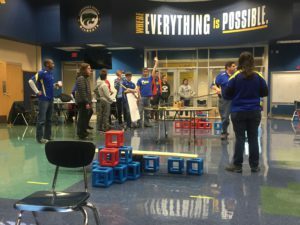 A few weeks later I went to my first ever FRC competition in Kokomo, which was a very interesting experience. That year’s competition season led to some even more fascinating experiences. I almost met Dean Kamen (one of the founders of FIRST), I wrote an essay about Dean Kamen (hoping one day I could show it to him), and it was my first time going to St. Louis for the World Championship. My freshman year was definitely more than I expected it to be. 2016 season was even better. Our team won all of the Indiana events, including the State Championship, and we made it to the World Championship a second time, which was quite exciting. It was cool to have continuous recognition from the whole IndianaFIRST community and our school district. But this year, as a junior myself, has been the most eventful, and that’s just within Build Season. I’ve learned so much from the mentors, especially Allison. She has given me the task of building the drivetrain for the comp bot and practice bot. And through this, she has taught a lot about what and whatnot to do when it comes to building something important, which has earned her a spot in my favourite mentors list. 2016 and 2017 are the years that I wanted to try new things. While trying new activities has always been difficult for me, I was ready to take on the challenge. This year when someone mentioned robotics to me, I believed that it might not be a bad idea, considering that I was looking for an extracurricular to do. I also thought that it would be great for me to look into robotics since I have never attempted anything in the engineering field. I remember the first day that I came to the shop and was actually quite surprised. I remember being immediately welcomed by both mentors and team members. My anxiety from before arriving to the shop dissipated, and I felt very comfortable. 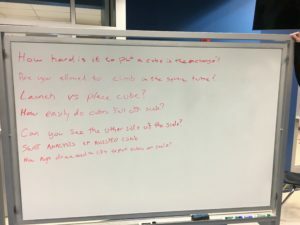 Prior to coming to the robotics shop, I simply thought that robotics was like one giant team project where people only connected on a “business casual” relationship. However, this is not the case at all. Multiple team members have told me that not only is robotics a place where people come together to build an awesome robot, but it is also a place where people come together and develop team building skills and, as some people would say “a family like relationship.” Team members and mentors are incredibly helpful and patient, which I very much appreciate. Though I haven’t been on the robotics team for that long, I am really enjoying my time on the team. I’m learning a lot about the different tools in the shop and started to learn about the CAD program Inventor. I realize that robotics is not so much what you know, but rather, how much you can learn and apply your engineering, programing, and building skills. 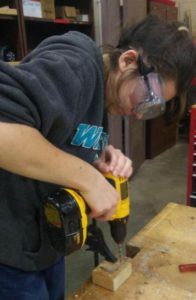 I’m glad to feel welcome in the shop and that everyone on the team is willing to help me learn new things, whether that is learn how to use a new machine, a new tool, understanding a new program, as well as the many other aspects of robotics. I’m excited to pursue more robotics activities and ready to learn more about the engineering skills and all that robotics has to offer.